Groucho Marx and Margaret Dumont share a soda in At the Circus (1939). This article is part of the Dynamic Duos in Classic Film Blogathon hosted by Once Upon a Screen and Classic Movie Hub. 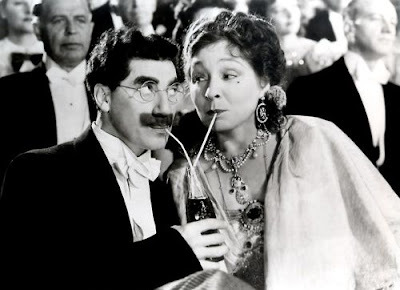 Margaret Dumont and Groucho Marx were one of the great comedy teams in classic movies. Despite their obvious differences -- she was a society matron with a background in opera, he was a product of vaudeville and New York's East Side--they delighted audiences in seven hilarious films and formed such an unlikely bond that many fans thought they were really married. The Dumont-Marx story begins on Oct. 20, 1882, when Dumont (real name Daisy Baker) was born in Brooklyn. She trained for a career in the opera, and in her early notices she was often described as a "statuesque beauty," but the young woman soon found that her real forte was in light comedy and operetta (Dumont began using her stage name during this period). In 1910, she married a wealthy man named John Moller, Jr., and retired from the stage. However, when Moller unexpectedly died in the 1918 flu pandemic, Dumont returned to acting on Broadway where she made her name by playing stuffy society matrons in comedies with titles like Go Easy, Mabel, The Rise of Rosie O'Reilly, and, most significantly, The Fourflusher. Julius Marx was born Oct. 2, 1890, in New York City to an immigrant father who worked as a tailor and a determined mother with show business aspirations. Julius loved reading and had ambitions of becoming a doctor, but his family lacked the money to pay for college, so Julius along with brothers Milton and Adolph (later nicknamed Gummo and Harpo) and another boy named Lou Levy hit the road as a singing group called The Four Nightingales. According to legend, The Four Nightingales were enduring a particularly bad night at a vaudeville house in Nagodoches, Texas, when Julius began hurling insults at the audience. Instead of walking out, the attendees howled with laughter and a new comedy team was born (A few years later vaudevillian Art Fisher gave Groucho his famous nickname). By 1925, The four Nightingales had transformed into the four Marx Brothers (Gummo and Lou Levy were replaced by Marx siblings Leonard aka Chico Marx and Herbert aka Zeppo Marx). The Marx's were top stars on Broadway, but they still needed the right actress to play a society matron in their new comedy, The Cocoanuts. Fortunately, writer George S. Kaufman remembered Dumont, whom he had been impressed with when he saw The Fourflusher. Dumont was perfection as the imperious Mrs. Potter, and she took on the role of hostess Mrs. Rittenhouse in the brothers' next play, Animal Crackers. 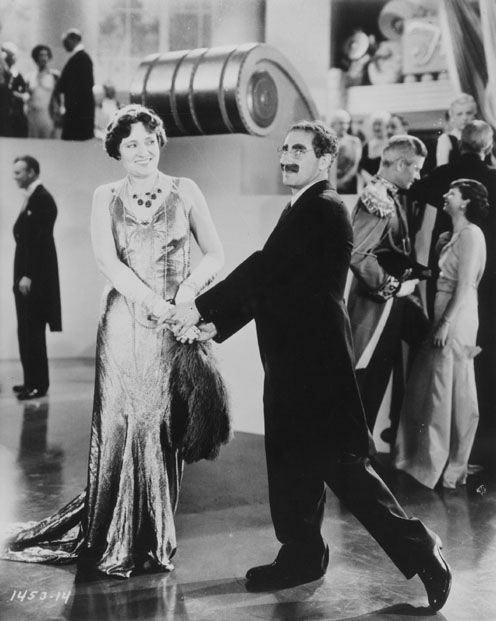 Margaret Dumont and Groucho Marx in Duck Soup (1933). Dumont reprised her stage roles in the film adaptations of The Cocoanuts and Animal Crackers, which were filmed in New York City. Dumont eventually followed the brothers to Hollywood where she played Mrs. Teasdale in the political satire, Duck Soup (1933). Dumont also made four films with the brothers at MGM: A Night at the Opera (1935), A Day at the Races (1937), At the Circus (1939), and The Big Store (1941). She appeared in several other comedies and musicals during this time period, most memorably as Mrs. Hemogloben in the W.C. Fields film, Never Give a Sucker an Even Break (1941). 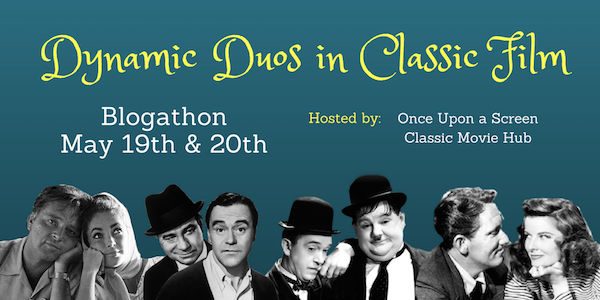 Dumont and Groucho play similar characters in all seven of their films together. He is a con artist who is romancing Dumont's character (mostly for her money), while she is a stuffy high-society type who rather inexplicably falls for Groucho's oddball charm. Much of the humor involves Groucho trying to con Dumont, Groucho insulting Dumont, and/or Dumont being placed in humiliating situations, e.g. the operating room scene in A Day at the Races, being shot from a cannon in At the Circus. Despite this, Dumont and Groucho, whom she affectionately nicknamed Julie, shared a warm and unexpected rapport, leading many fans to believe they were married off screen a la Gracie Allen and George Burns. There has been a persistent legend that Dumont did not understand the brothers' humor, which was partially fueled by Groucho's later recollections; for example, he remembered Dumont asking him "Julie, why are they laughing?" during a stage performance. While some of the jokes may have went over her head, Dumont was a much shrewder person than her screen image would suggest. According to Groucho biographer Stefan Kanfer, she meticulously read reviews and newspaper articles about her appearances with Groucho. She also cherished her role as the "fifth Marx Brother," which she made clear in a 1941 interview for The Big Store. "I'm not a stooge, I'm a straight lady," she told World Wide Features. "There's an art to playing straight. You must build up your man but never top him, never steal laughs from him." All seven of Dumont's films with the Marx Brothers are worth watching, but here are three of my favorites. Best line: "Remember you're fighting for this woman's honor, which is probably more than she ever did." Funniest moment: This scene in which Groucho switches from insults to a marriage proposal after he finds out how much Mrs. Teasdale is worth. "Were you vaccinated with a phonograph needle" makes me chuckle every time. Available on video on demand and DVD. 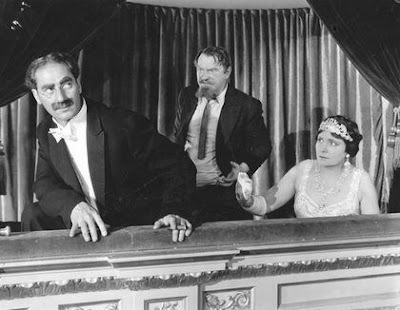 Groucho Marx, Sig Ruman, and Margaret Dumont in A Night at the Opera (1935). Groucho plays Otis P. Driftwood the shyster "business manager" for wealthy society matron, Mrs. Claypool (Dumont). Best line: "I saw Mrs. Claypool first. Of course, her mother really saw her first, but there's no point bringing the Civil War into this." Funniest moment: Driftwood tries to convince Mrs. Claypool that he had dinner with another woman because "she reminded me of you" (clip here). Streaming on FilmStruck and on DVD. 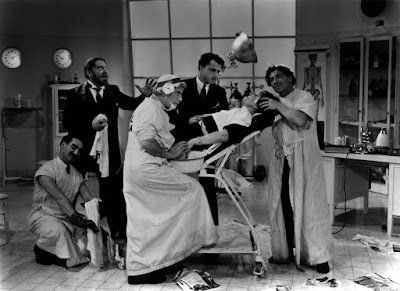 A young sanitarium owner (Maureen O'Sullivan) hires veterinarian Hugo V. Hackenbush (Groucho Marx) at the insistence of wealthy patient Mrs. Emily Upjohn (Dumont). Best Line: "Write 'I love you, Emily,' on the back of the bill," Hackenbush's instructions upon sending flowers to Mrs. Upjohn. 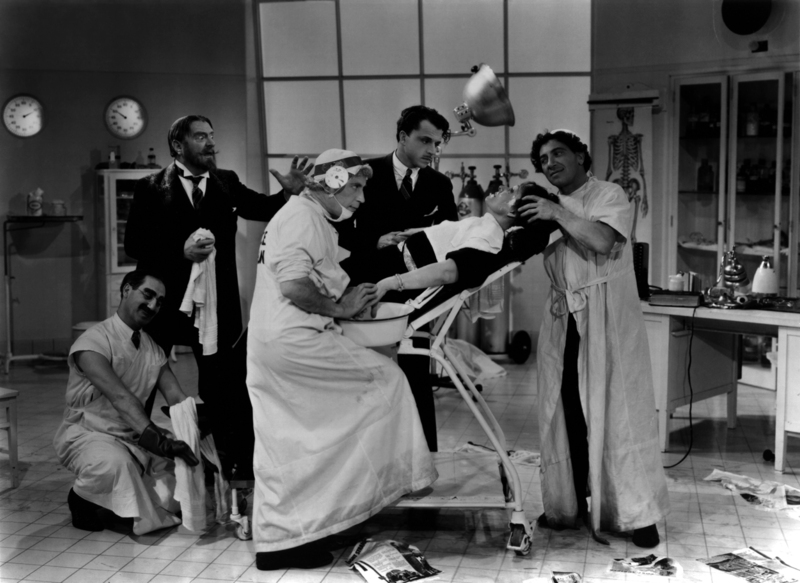 Funniest moment: The operating room scene, which is one of the great comedy set pieces in movie history (I can't find a clip of this one). Available on video on demand and DVD. I'll leave you with this wonderful TV appearance by Dumont and Groucho shortly before her death on March 6, 1965. The video is not very good quality, but Dumont looks sensational, and she clearly gets the joke; in fact, Groucho teases her for laughing so much as they recreate the "Hooray for Captain Spaulding" number from Animal Crackers. 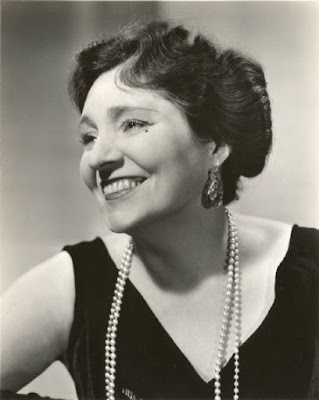 Ah, Margaret Dumont, the unheralded fifth Marx brother! ;) I adore her, and I think she is THE perfect straight man. As funny as Groucho Marx is, sometimes his lines need help, and Margaret's reactions make them funny than they would be otherwise. Groucho needed a target for his humor and Maggie was the perfect target. She must have had a great sense of humor and a great deal of self-confidence to take all those jokes through the years. Thank you for this - I think Margaret Dumont is one of the great straight men and she rarely gets her due. It's always fun to watch her and Groucho. She sounds like a pretty interesting lady in her own right! A thoroughly delightful article with much information and wonderful memories. I was fascinated by Margaret's background and so happy that the show biz gods brought her and Julie together for us. I didn't know her real name was Daisy Baker. She just seems so much more like a Margaret Dumont.